The Vampire Facial continues to be one of the most popular cosmetic facial procedures. Dr. Charles Runels, a cosmetic doctor, trademarked the name in order to standardize the treatment. Only providers trained by Dr. Runels and The Cellular Medicine Association are licensed to perform the Vampire Facial. Rachel Cohen NP and Mimi Connelly NP are part of this exclusive network of providers and successfully completed training for the advanced preparation and use of platelet rich plasma combined with micro-needling for the stimulation of collagen and for the treatment of wrinkles and scars, commonly called the Vampire Facial. 1) Topical skin creams and facial peels are helpful, but not strong enough to adequately rejuvenate the tissue. 2) Retinols and hydroquinone may improve skin texture and color, but results may take several months-years. 3) Hyaluronic acid fillers (like Juvederm) restore volume, but do not increase skin firmness. The Vampire Facial uses growth factors, combined with microneedling to turn on the skin’s healing mechanisms thus leading to a decrease in fine lines and wrinkles, increased elasticity and firmness, smoother texture, and younger color. The Vampire Facial uses a vial of the patients own blood in order to extract the PRP (platelet rich plasma) and collagen rich growth factors. The Vampire Facial starts with a routine blood draw, or venipuncture, from your arm; just like getting blood drawn at your doctor’s office. The tube of blood is then placed in a centrifuge (a machine that spins the blood at a fast rate) in order to separate the red blood cells from the serum (white blood cells and platelets). Platelets contain growth factors which help stimulate collagen production and cell turnover. The face is then treated with a microneedling device (a small facial roller or pen device which contains hundreds of tiny needles). The process of microneedling creates microtrauma to the skin allowing the PRP (platelet rich plasma) to penetrate the skin and deliver the body’s own growth factors to the enhance the activity of your skin cells and improve the quality of the skin. These growth factors then activate the skin’s own stem cells (tricking them into "thinking" there's been an injury and new younger tissue should generated). The provider then applies Altar cream post procedure. 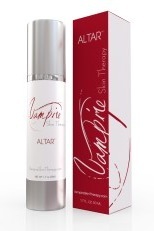 Altar is a trademarked Vampire Skin Therapy exclusively available to providers who are licensed to perform the Vampire Facial. Altar synergistically enhances the effects of the Vampire Facial, accelerates healing by helping to supply blood flow to fragile new growth of healthy pleuripotent stem cells, and increases skin firmness and elasticity. The stem cells develop in to new collagen, blood vessels, and new fatty tissue trying to “repair” the skin that was never injured. The face may look a bit red immediately following the treatment and redness may last a day or two. Applying sunscreen is a must to protect the freshly treated skin. The effects of the procedure improve for 2 to 3 months and last for at least 1 to 2 years.